June 21, 2015 November 26, 2016 Lisa A.
I’m excited to watch it this coming Friday, June 26. I still enjoy the first one every single time I watch it. The first one is a good movie to watch after a long, tiring day and/or crappy day. The movie still makes me laugh very hard. I like some Family Guy episodes but not all of them. 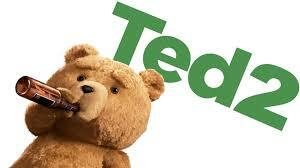 Seth MacFarlan (the creator of Family Guy) plays Ted. You of course recognize the same type of MacFarlan humor in Ted. Both are definitely not for children. I’m guilty of allowing my son to watch Family Guy when he was smaller because he didn’t understand the jokes. No WAY is he allowed to watch it anymore. Thank Goodness he’s completely lost interest in Family Guy. I’m also surprised and grateful he hasn’t asked me to watch the first or second part of Ted. The answer would be NO! Thank you for stopping by! I’m going to check out your blog. I really enjoy seeing both the Jump Streets! They’re SOOOOO MUCH FUN!!! !